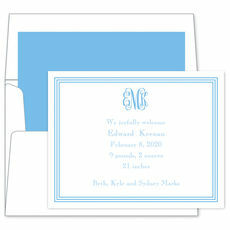 Sample shown using Script Monogram with Cornflower ink. 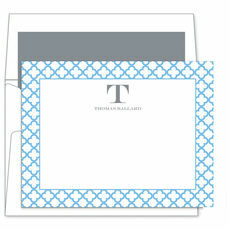 Sample shown using Classic Monogram with Navy ink. Set of flat note cards. 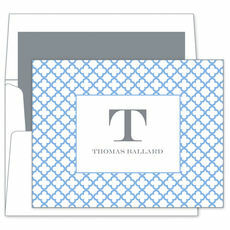 Flat printed in your choice of monogram style and ink color. Size 5.5" x 4.25". Blank envelopes included. Printed return address and optional envelope lining available. Positioning and typestyle only as shown. Border design will appear in color as shown.